Merge Data Ranges for Excel (Merge Tables Wizard) allows to merge data between or within Excel workbooks and provides several options to save time in accurately merging Excel data. The Merge Data Ranges for Excel add-in is simple and easy to use as an alternative to Excel LOOKUP and VLOOKUP functions. Find and merge data from two Excel ranges by following 5 easy wizard steps. Use one or more column ranges as the matching criteria. Compare and merge Excel data from different workbooks. Add new columns to the destination table or update data in existing columns. Add non-matching rows to the end of the destination data table. Color updated rows, with variety of different color formats. Ignore extra spaces in matching column ranges. Update only empty cells in the destination table so not to overwrite existing values. Update only if cells from the look up table contains data. Add a status column to the destination table to reflect changes highlighted as Updated, Non-updated or New row. Supports all Excel file formats including 2007 and 2010. 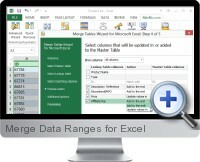 Merge Data Ranges for Excel is also available at a discounted price in the Excel Add-ins Collection Download.